I was walking down Court Street one day in the merry merry month of May, and was taken by surprise by this book! Monday had come and gone, busy and too short, and I was puzzling over what to write when voila, the wily cheese deities dropped this little gem in my path. Brown meat in oil. Add beef broth, water, and seasonings; cover and simmer 1 hour. Add vegetables and continue to simmer 30 minutes or until vegetables are tender. Pour into baking dish. Stir cheese into potatoes; spoon on top of hot stew. Broil until potatoes are lightly browned. Sprinkle with additional cheese if desired. Quicker way: (My personal fave) Two cans of canned stew may be used. Well, I hope I haven’t spoiled anybody’s breakfast. 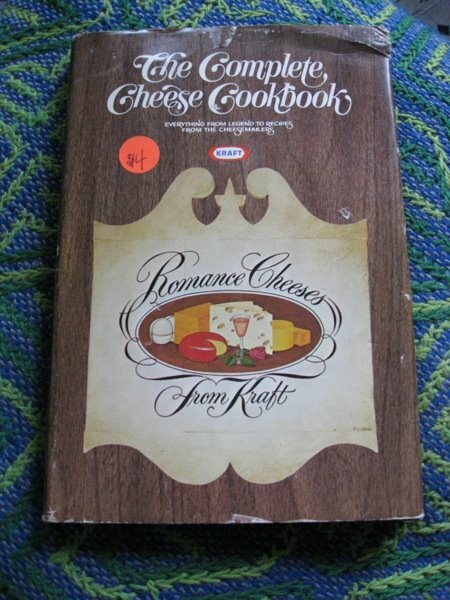 Stay tuned for more intermittent dispatches from the world of 1970’s process cheese food products! < Third Year’s a Charm!